Senator Felix Kola Ogunwale (Jumokol) , PDP gubernatorial candidate for Osun State, went spiritual during the PDP South West Mega Rally as he declared through a song in Yoruba that "God is the mighty one and we humans are weak." Senator Ogunwale said "Aregbesola, the governor of Osun State, has destroyed every thing in the state that was kept under his care." He declared this to the cheers of the massive crowd while greeting the mammoth crowd during the Mega Rally. 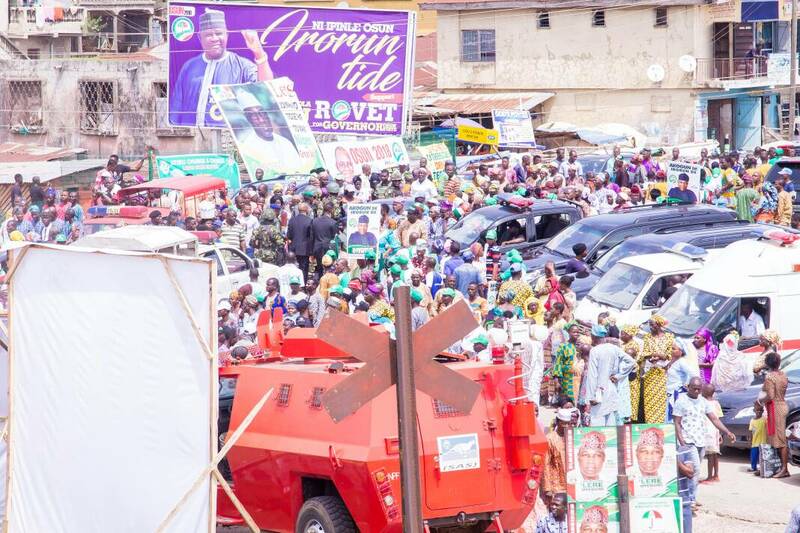 The Senator concluded that the mighty God is set to deliver Osun State from the pangs of Ogbeni Rauf Aregbesola. 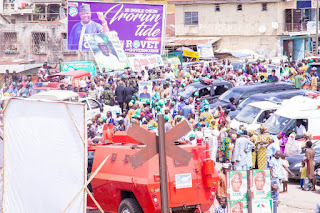 Amidst the crowd are large number of the supporters of Senator Kola Ogunwale, who stormed the rally ground with placards, posters and banners all carrying picture designs and various inscriptions displaying unalloyed support for the governorship aspiration of Senator Kola Ogunwale.